I now have another pattern available. It is shown, along with the link to my PatternSpot.com “store” where all my patterns are available for purchase. Just as a reminder, there are a bunch of free patterns shown on my pattern page in this blog that you can download directly if you need an easy pattern for a lap quilt. Here is Squares Upon Squares. The focus blocks were made with Shiva Paintstiks and rubbing plates, as I described in a post last spring. A great pattern for showcasing those small blocks you like a lot but don’t know quite what to do with! All those little borders in the blocks allow size adjustments as necessary to fit your particular block. Or just leave out a border or two if your special blocks are bigger. 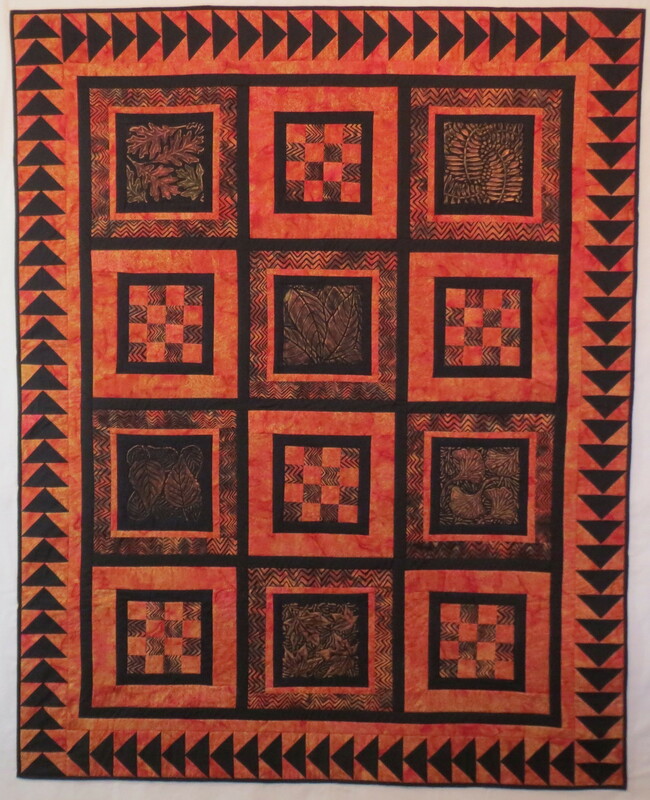 This entry was posted in Quilting on October 4, 2014 by Shirley at Mystery Bay Quilt Design.